Now You Can Easily Practice Suturing Techniques At The Comfort Of Your Home! Looking for a heavy-duty, realistic and ergonomic suture pad? Need a complete set of suturing tools that will help you improve your skills? Want to practice different suturing techniques with a single all-in-one suture equipment set? Introducing The Ultimate All-Inclusive Suture Practice Kit By Mediroc! Now you can enjoy a professional suturing simulation experience with our 23-piece medical suture kit, which includes everything you need in order to practice or demonstrate various suturing techniques. 1 x Superior- Quality Suture Pad - Our 5" x 7" suture pad features 4 different layers in order to offer a realistic experience. (Epidermis, Mesh Layer, Dermis and Subcutaneous Tissue). What makes our suture training pad so special is it's odorless and that the integrated mesh layer will prevent damage and ensure tension durability. Why Settle For Cheaply-Made Suture Kits? Our professional-grade suturing practice kit is perfect for medical students, educators, vets, nurses and physicians who want to take their suturing skills to the next level, prepare for exams or demonstrate various suturing techniques on different wounds. 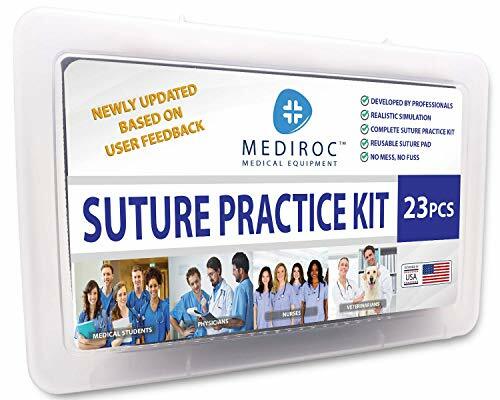 HERE'S HOW YOU CAN PRACTICE YOUR SUTURING TECHNIQUES AT HOME with the Mediroc premium suture kit, which includes everything you might need, from a realistic suture pad to multiple suture tools. Now you don't have to buy different products in order to master your suturing skills, since our all-inclusive suture practice kit will allow you to practice suturing a variety of wounds from the comfort of your home. DISCOVER THE NEW & UPDATED SUTURE PAD WITH A MESH LAYER, which was designed after careful research and was based on YOUR FEEDBACK. The 4-layered silicone suturing pad features an innovative integrated mesh layer under the simulated epidermis in order to help your suture pad endure any abuse without tearing. In addition, our 5" x 7" suturing pad will offer you a realistic human tissue simulation experience, which will help you improve your skills. TRAIN ON 12 DIFFERENT SUTURE THREAD AND NEEDLE TYPES USING OUR PROFESSIONAL SUTURE TOOLS, which are not only 100% rustproof and ergonomically designed, but also ultra-sharp and medical-grade. Our practice suture kit includes 1x 5" needle driver, 1x 4.5" iris scissors, 1x 5" Adson toothed forceps, 1x blade handle, 1x 5" mosquito forceps and 5x #11 sterile sharp blades. Plus, the convenient travel box and zipper case will help you keep your suturing tools neatly organized. THE CLOSEST HUMAN TISSUE EXPERIENCE YOU CAN GET! Ideal for veterinarians, medical students, nurses, physicians and suturing trainers, our comprehensive suture pack will help you learn how to skillfully perform suturing techniques, masterfully use your surgical-grade tools and prepare yourself for exams. 100% SATISFACTION OR YOUR MONEY BACK! That's our unconditional guarantee! Our mission is to offer you a professional-grade suture practice set and allow you to enhance your suturing skills. That's why we have designed it in collaboration with doctors and back it with our EXCLUSIVE peace-of-mind guarantee. If you are not 100% thrilled with your suture practice pad and suturing tools, we promise to offer you a prompt and full refund. If you have any questions about this product by Mediroc, contact us by completing and submitting the form below. If you are looking for a specif part number, please include it with your message.